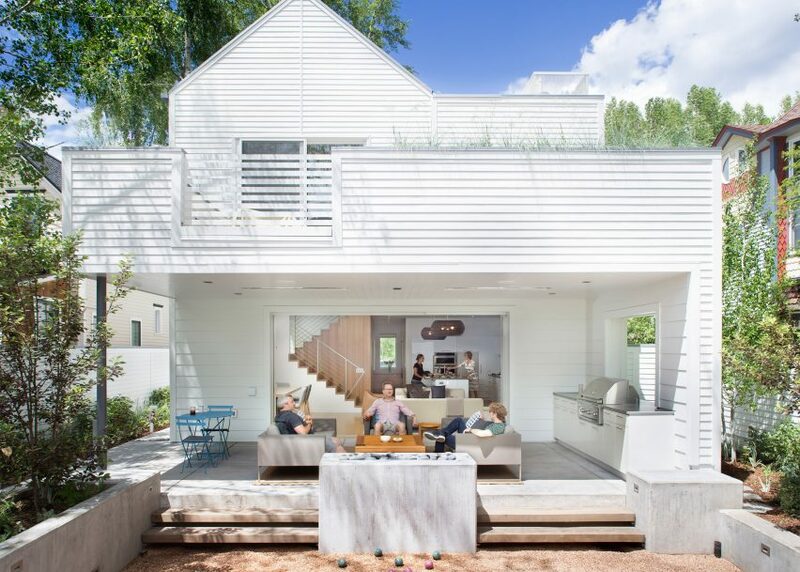 "The historic home was picked up and placed on a new foundation, creating a vacant lot for Game On," said Rowland + Broughton, which has offices in Aspen and Denver. The new dwelling "needed to stand on its own" while also being contextually appropriate, especially considering that the project required approval from the city's Historic Preservation Commission. In response, the studio conceived a home with white, fibre-cement siding, a traditional front porch and a gabled roof – all meant to serve as an ode to the city's architectural heritage. "Inspired by the residential vernacular of Aspen's historic West End neighbourhood, this home brings a sense of clarity and elegance to a traditionally ornate Victorian form," the team said. Rectangular in plan, the residence contains a main dwelling and a detached garage, which are separated by a small yard with a bocce ball court. In the front, a pathway crosses over a small stream and leads to the home's main entrance. Encompassing 4,291 square feet (399 square metres), the residence was designed to feel private and intimate, while also having the ability to accommodate a large number of guests. "The home is modern and efficient with no unused space," the team said. In the main dwelling, the ground floor contains an open-plan kitchen, living and dining area, where a retractable glass wall provides a seamless connection to a covered terrace. The upper level contains a guest bedroom and a master suite with a terrace. An open room and storage area were placed in the basement. A second basement located in the garage structure encompasses a great room and a bathroom. Throughout the interior, the architects employed a restrained palette of colours and materials, and sought to "create an indoor environmental quality free of harmful chemicals". Finishes include concrete, wood and eco-friendly paint. Floors and walls are sheathed in light-coloured oak, which helps the space feel bright and airy. Rooms are fitted with built-in furniture and contemporary decor. The exterior landscaping features drought-tolerant plants, which help reduce water usage. Other sustainable elements include lighting, plumbing fixtures and mechanical systems that are highly efficient, along with solar panels that are mounted to the garage roof. The bocce ball court is also a sustainable feature, as it helps control stormwater. "The court was designed to accept all the surface run-off as a permanent stormwater control," the firm said. The project earned LEED Gold certification from the US Green Building Council. Other projects by Rowland + Broughton include a rectilinear home nestled into a mountainous site in rural Colorado.